Comments: Obi-Wan Kenobi meets the bounty hunter Jango Fett on Kamino, an encounter that ends in a fierce battle. Fett is suspicious of the Jedi and tries to escape with his son Boba before he can be detained by Obi-Wan. The underlying tension in their first meeting turns into open conflict as the two skilled warriors engage each other in combat on a rain-drenched landing platform. Boba Fett: Jango's son helps his father from the cockpit of Slave I during the battle between Jango and Obi-Wan. Boba Fett is a repaint of 2002's SAGA Boba Fett (Kamino Escape). Boba Fett did not wear the extra gear in the film. Jango Fett: The bounty hunter was used as the "blueprint" for the secret clone army being created on Kamino. Jango Fett is a repaint of 2002's SAGA Jango Fett (Kamino Escape). This time around, the grappling hook rope has been removed from the right gauntlet. Obi-Wan Kenobi: Obi-Wan flies to the rain-drenched world of Kamino to investigate an attempt on Senator Amidala's life. 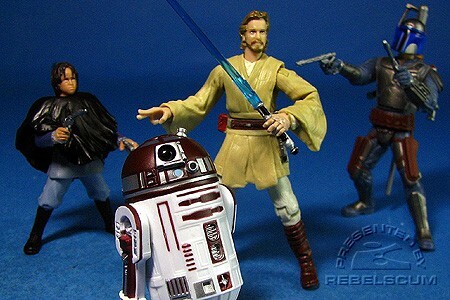 Obi-Wan Kenobi is a repaint of 2003's SAGA Obi-Wan Kenobi (Outlander Nightclub Encounter). This figure is inaccurate for this set: Obi-Wan wore his Jedi robe while on Kamino. R4-P17: Obi-Wan Kenobi's astromech droid provides navigational assistance and makes necessary repairs to the jedi's starfighter. R4-P17 is a repaint of 2005's ROTS R4-P17. This figure is inaccurate for this set: R4-P17 did not have a full body during this timeframe. This set incorporates two scenes from the movie: the duel between Jango Fett and Obi-Wan Kenobi, with R4-P17 added in for no apparent reason. All 4 characters were never actually onscreen together.